Is your Outlook troubling you by showing errors or have been impacted PST file so brutally that data is no longer accessible? If so, then read how to repair corrupt PST file automatically using advanced & best Outlook PST Recovery tool and regain error free PST file. Outlook PST file repair tool also restored lost emails, contacts, journals, tasks and calendar in PST / BAK file from Outlook 2016, 2013, 2010, 2007 and below versions. Repair broken PST file and Outlook deleted items like Emails, Contacts, Calendars etc. Two scanning modes are offered by Outlook Repair tool to repair corrupted Outlook PST file or BAK file generated by ScanPST.exe. Quick scan mode is the default mode for minimum corruption level in PST file and Advance scan mode is to repair highly corrupted PST file. For example: The mails that are deleted permanently by mistake can also be recovered. Outlook file repair tool repair PST file that gets corrupt due to 2GB file size limitation, as the previous version of Outlook only allows data to be stored up to 2GB. Whenever the assigned limit is crossed, the Outlook data file becomes more vulnerable to corruption and some time it gets corrupt too. 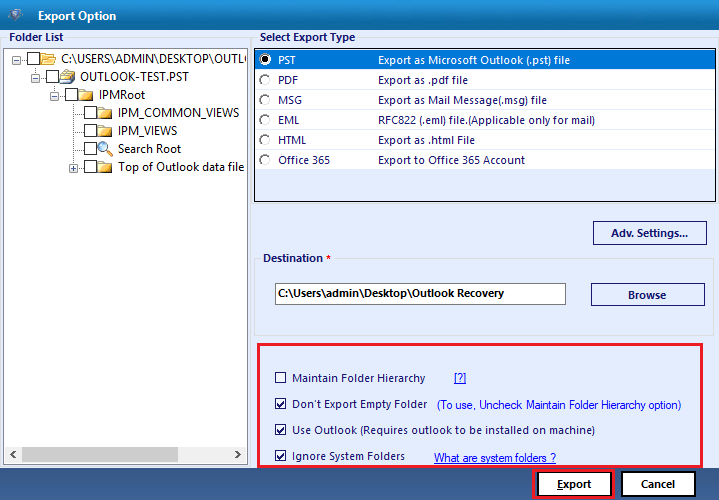 PST repair tool also works on archived Outlook folders that have been corrupted somehow. 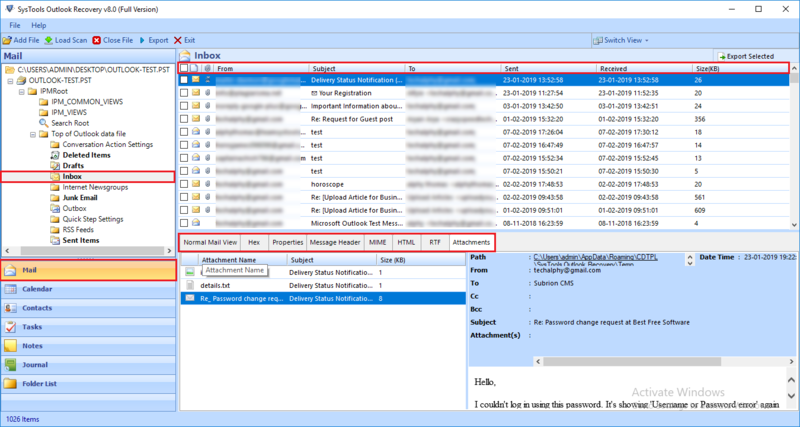 Recover Lost Outlook Items with Attributes – Contacts, Calendars, Tasks, etc. Microsoft PST recovery tool maintains the original data structure of all Outlook items like emails, contacts, calendars, etc. and will keep the meta data untouched after the completion of the Outlook PST recovery process. It shows the 100% data security as it neither edited nor deleted a single bit of information. 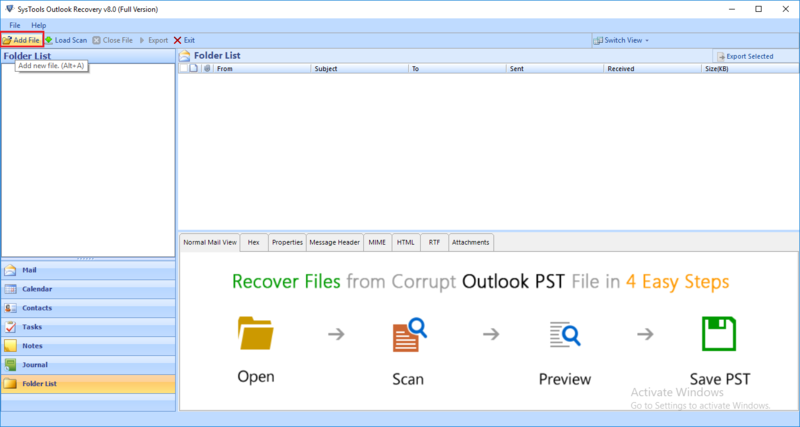 Outlook repair tool allows to preview all the emails with their corresponding attachments in an inbuilt viewer, so that you can see whether all your mails are recovered or not. The whole PST file can be viewed including Outlook inbox, tasks, notes, journals, etc. PST repair tool export repaired Outlook data file in different file formats like PST, HTML, PDF, MSG, EML. Saving PST as MSG or EML file will permit you to read & open emails on multiple email client platforms like Outlook Express, Windows Live Mail and Windows Mail, etc. Outlook file repair tool export selected folder or mails by using the check button, which is available along with each & every mail and folder. In order to save time, instead of exporting the whole PST file, user can use this option and can export only the required data. 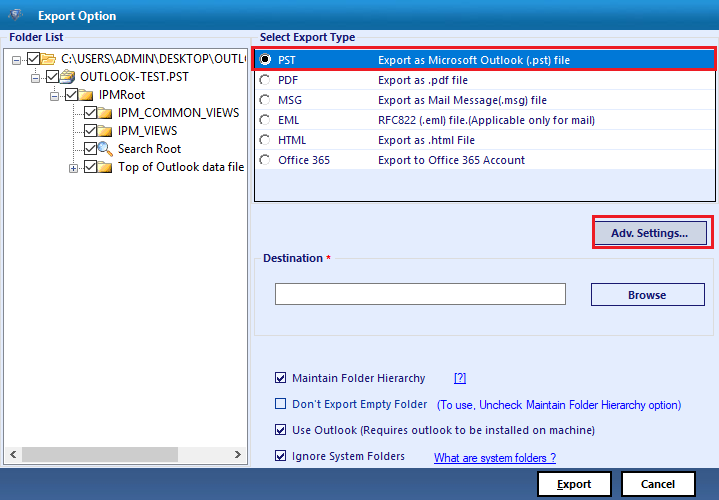 An additional option to filter the required mails is also provided by the Outlook repair tool. This can be used in various situations like to export the mails of specific duration. It will filter the mails & export only the mails within the specified location. Break larger PST into smaller parts with the help of Split feature. Here you have to assign a particular size from 1 to 45 GB for PST file and Outlook PST repair tool will create multiple PST files of the specified size which can be further managed easily. The other benefit is small size files can be transferred easily as compared to large size files. PST file repair tool allows to store Outlook data at the required location, either you can select one of PST folders to save the data or create a new one. To Restore Outlook PST at the defined location you have to just browse the path. Outlook Repair tool provides you an adjustable view mode similar to Microsoft Outlook that helps you in switching from horizontal to vertical screen as per the convenience. By default it is set to horizontal mode, but as per the requirement you can switch to the vertical view mode. Once the items of Outlook data file are successfully exported, Microsoft Outlook PST repair tool will generate a progress report, which carries all the information regarding export like location of mailbox and exported PST file. For future reference, you can save that export report in CSV format. Since PST Repair Tool is a third party application, Does it give assurance of 100% data integrity (after recovery)? Yes, Outlook PST file recovery tool just does not give assurance of 100% recovery, but also ensure data integrity of Outlook data file and data within it. Is there any kind of limitation of huge size of Outlook Data File to run with Outlook Repair Tool? Certainly No, whether you have PST file of 30 GB or running a test on 2 GB, the Outlook file repair software will work in virtual manner. I somehow vanished my sent mailbox and later on, I found that some of the emails from them are vital for me. Will Outlook PST file repair tool be able to recover permanently deleted emails? Obviously yes, the most salient feature of the tool is that it can recover hard deleted Outlook items including as well as lost contacts, calendars, tasks and journals. In which format, the Outlook recovery software provides resultant PST file? PST recovery tool creates and restored all the repaired data into an UNICODE PST file because all the latest version of Microsoft Outlook supports UNICODE file format. Somewhere, I had read that this PST repair software is kind of substitute of free scanpst tool? Is it true? Outlook Repair Tool is far more than powerful than the any free tool repair pst because when it comes to data protection, our tool gets more numbers. In addition, free Outlook Inbox repair tool or scanpst doesn't come with a guarantee to restore lost Outlook emails, contacts and other items, though it is free. In case, if you have BAK file created by Inbox Repair Tool while repair process, then you can even access data from BAK file and save it as PST, PDF, EML, MSG, HTML or in Office 365. I have been running into a problem and software is prompting given error: "Outlook Session Creation Error". If the software is stand-still and arousing error rather than scanning PST file, then improper installation of Microsoft Outlook make a mark on functioning. Re-configuring Outlook would be worth doing in such a case. What can I do with the Demo version of this PST Repair Software? 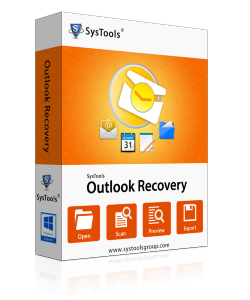 With the help of free demo of Outlook recovery tool, you can repair your corrupt Outlook PST file as well as you can restore Outlook BAK file data in PST, EML, HTML, MSG, PDF. Free preview of Outlook PST file / BAK file items such as emails, contacts, calendars, tasks, notes, journals etc. You can only export 25 items per folder only in free trial version. This PST Repair Tool is really commendable. I mean, if you talk about the sustainability, then this software should rank on number 1 because it comprises most wonderfull features like removing email encryption from emil message, repair and recover PST / BAK file, sort, filter, naming convention, split options, save as PST, EML, MSG, HTML, PDF, Office 365 formats etc. I do not know why my PST File was inaccessible and when I tried to perform repair on it using Microsoft's free repair pst tool, the results came to nothing. Thanks MSOutlookWare for developing such kind of Outlook PST Repair tool. 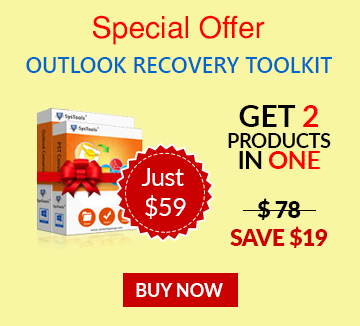 I bought Outlook Repair tool and recovered all Outlook's items subtly. I have tried Inbox Repair Tool to recover permanently deleted Outlook emails but it does not work. Then, I did Google for an advanced utility to recover lost emails from Outlook. There were many tools available and I used few of them. But due to its advanced features and low cost, I purchased Outlook PST repair tool and recovered my lost data from Outlook with attachments. Really, the tool worked great. Thanks to developers. I would also refer this application to those user who have issue in PST file.